Guldens was rescued from the side of the road at a very young age. 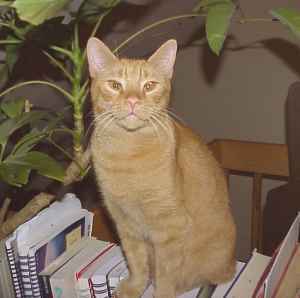 He spent about 2 years in a Kitty Angels foster home, before becoming Patt and John's 14th Kitty Angel in January 1999. He is a sweet boy who likes other cats as much as he likes his food! Gypsy is a timid little girl who is afraid of people. She loves other cats however, and seems to enjoy being a part of the feline community in Patt and John's home. She became their 16th Kitty Angel in January 1999, at the age of 1 year 3 months. 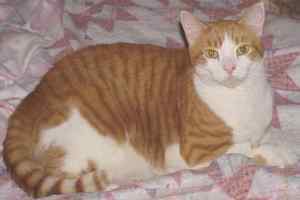 Jake is a very sociable, outgoing and affectionate boy who loves people and other cats. He is also playful and very talkative, and, he's not afraid to 'ask' for whatever he wants! 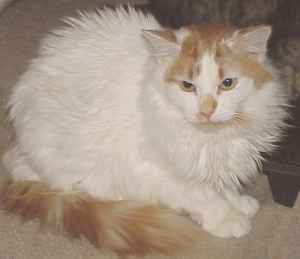 He became Patt and John's 17th Kitty Angel in July 2000, at the age of 2 years. 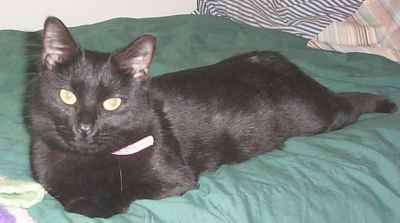 Chanel was adopted in December 2000 by Jesse, who writes, "I am so happy that I got her! she is a wonderful cat."